How Much Do Home Additions Cost? When considering new home additions, there are many aspects to iron out before you start any work. Choosing a contractor could arguably be the most important decision of all. A plumber, for example, will be critical to your project if you are adding a kitchen or bathroom. When considering additions to your home, you will have to take local buildings codes into account and choose between different types and quality of materials too. A knowledgeable contractor will also be able to help you lower your budget by, for example, using ABS piping rather than PVC. The cost to build home additions will be determined by many factors, so it is up to you to make several critical decisions. Understanding the cost breakdown is extremely vital to ensure that you get the maximum benefit for your budget. This allows you to see where best to spend your money and where not to waste it. Depending on what type of home addition you are planning, the cost will vary immensely across the spectrum. The more extensive the renovation is, the greater the overall size of the project and those involved. What type of home addition are you considering? For example, upstairs additions don't require a foundation or slab, which reduces the cost. It will, however, require more tear down, which increases the overall cost to build home additions, unless the house has a flat roof. Because there is no one home addition size that fits all, here are a few cost averages for the most common American home additions. DIY bathroom additions can cost between $500 - $1,500 for the basic bathroom. Larger, more luxurious DIY projects can cost $2,000 - $4,000. Having a professional change existing floor space into a bathroom costs $3,000 - $6,000 depending on ease of access, size, fixture quality, and amenities. Expect to spend in the region of $7,000 - $25,000 for professional installation with spa-like features, master baths, and foundation reinforcement. If a professional adds floor space, you can expect to spend between $25,000 - $50,000 for 6ft x 8ft bathroom addition, or up to as much as $80,000 for spa-like features. DIY bedroom additions can cost $200 - $5,000 for a 10ft x 15ft bedroom on existing floor space. A professional bedroom addition can cost anywhere between $7,500 - $50,000. Additional floor space for a 15ft x 10ft bedroom will cost $3,750 - $7,500 for DIY bedroom additions, and professionally $7,500 - $22,500. A porch addition ranges from $50-$120 for DIY material, or $3,000-$6,000 for a professional 50 ft x 20 ft concrete slab. A DIY family room built over existing floor space can cost between $200 - $5,000 depending on project complexity, material quality, and skill level. Hiring a professional will cost between $7,500 - $25,000 depending on size and what is included. Adding floor space for a 400 sq ft family room addition can cost $10,000 - $20,000 for DIY, and for a professional built addition $30,000-$100,000. 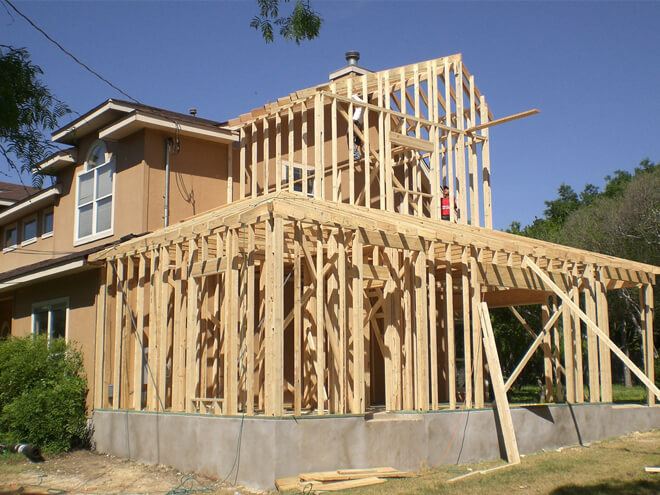 Building a DIY second story home addition of 1,500 sq ft can cost between $105,000 - $225,000. Hiring a professional contractor for the same 2 story addition can cost as much as $225,000 - $450,000. Adding a deck can cost up to $1000 for materials and DIY, and $2,000 to hire someone to build it. A larger deck can cost between $4,000 - $25,000 depending on size and materials. These two go hand in hand. Planning involves blueprints done by a professional draftsperson with assistance from an architect. There are more costs to consider before you can get to knocking walls down. Existing: This is only used for small or micro scale additions. Traditional: Designed by hand and printed on vellum. CAD (Computer-Aided Design): A draftsperson will use tailored programs to create the blueprints. A typical draftsperson charges between $100 - $130 per hour. Standard additions can take up to 2 days to draft, costing between $800 - $2100. A schematic design of the floor plans, with sketches of the elevation and space both exterior and interior, can cost $600 - $1500. Certain home additions will require a walk-through or a consultation on the current space to get a better understanding of the layout and where the addition will be situated. This can take between 2 - 4 hours and cost anywhere between $200 - $500. Permit and zoning applications also vary depending on your location and local regulations, and usually costs between $200 - $400. Home additions larger than 600 sq ft, or more than one story high, may need to be certified by a structural engineer. A stamp of certification can cost $500 - $1000 per blueprint. When deciding to do home additions, it is of utmost importance to compare as many quotes as possible from reputable contractors. It's highly recommended that you check for references and view some of their previous projects whenever possible before any work commences. How Much Does It Cost To Build Home Additions? Demolition or excavation costs will vary according to the size of the area needing preparation. Concrete pouring or slabs cost on average $75 per cubic yard. Roof trusses or support beam prices will vary depending on the carpenter you choose and his methods. Asphalt shingles or galvanized metal flashing cost on average $80 - $100 per sq ft. Installation time can run up to 16 hours and are generally included in the cost. Window additions are always a great decision with so many styles and types to choose from. Most home addition windows cost between $300 - $700 per window including installation. Carpeting can cost on average between $15 - $25 per sq ft, including the padding and installation. Electrical wiring and lighting alteration will depend on the amount of work required. The general cost for an electrician is between $65 - $85 per hour. Carpentry to code will depend on the amount of work needed. Carpenters charge an average hourly rate of $70 an hour. Be sure you balance what your costs are compared to how much you can get out of it, and don't over build. Also be careful of pulling down the value of a custom house by doing an addition that is lower quality than main house. Home additions should not just be considered for your current dwelling, but the future of your property too. Moving into a smaller home with an eye on renovations is a great idea, but you should calculate the overall cost of your home including the additions and then compare it to the price of the larger property. This way you will know whether or not buying a smaller house and adding on is really a better option. For example, if your home is 2,000 sq ft and priced at $400,000, your per square footage amounts to $200. Should your additional home additions make your property 3,000 sq ft, you should again calculate the total your home will be worth per sq ft after renovations. This will give you a better indication of whether or not additions will actually be worth it. Talk to contractors in your area to get a breakdown of the pricing, and then compare estimates. Remember, there are always some hidden costs when it comes to home additions, so include the cost of your contractor, the materials, loan interest charges, time off work and hotel fees if you plan to move out during the process. Once you have calculated all the costs, only then can you actually work out a more accurate price per sq ft. The cost to build home additions will vary from one region to another. If you would like to get a more accurate idea of the cost for your particular additions, you can reach out to a professional contractor in your area now who is willing to assist you with a FREE estimate of the total cost. To get a 100% FREE quote on your home addition project, simply enter your home zip code in the space provided below. We'll put you in contact with a registered professionals in your area. Remember, there is zero obligation to purchase, hire, or sign any contracts and there are absolutely no hidden costs attached to this offer. Simply enter your home zip code to receive assistance from highly skilled contractors near you. The overall cost of your home additions will vary depending on the extent of your project and the design choices you ultimately make. For a more exact breakdown of the cost, get in touch with professionals for a FREE estimate.